Economics is the study of how people manage their limited resources to produce goods. While studying economics, these topics are very important: trade barriers, specialization, and exchange rates. Trade Barriers: Trade Barriers are governmental policies that interfere with trade between two countries. Some examples would include: tariff, quota, and embargo. A tariff is a tax on imports coming into a country. A quota is a limit on products coming into a country. An embargo is when a country cuts off trade with another. A tariff and quota are both used to protect products in a country, not foreign goods. Embargoes can be used to make a political statement, such as telling a country to stop a violent act. Exchange Rates: Not all nations have the same type of currency. The money in some countries will be worth more or less than others. The reason we need a currency exchange rate is so that we don’t give someone too much money for an item. If we didn't have a system of currency exchange, we couldn't make fair deals when trading. Specialization: Specialization is when a country focuses their time and resources on one product, then trades for what they need. When countries use specialization, they have to trade for what they can not make. Ex. If a country has metals but no arable land (where you can grow crops) they make products using those metals and trade for crops with another country. This heavily supports trade in modern times. -Trade Barriers help nations by protecting products made in that country or by making political statements. -Exchange Rates are used to regulate a system of currency exhange. Without it, we couldn't trade fairly. -Specialization helps encourage trade because two countries make what they can and trade for what they can't. -trade: voluntary exchange of goods and services. -trade barrier: something that interferes with trade to a country. -quota: a trade barrier that limits products that come into a country. -tariff: trade barrier that imposes a tax on products coming into a country. -embargo: a trade barrier that cuts off all trade to a country. -specialization: When a country focuses on one product and trades for other needed goods. 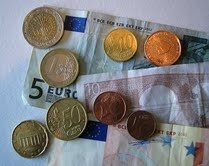 -exchange rate: the amount of money one currency trades for another.